I am very disappointed in Blogger these days. I logged into my account several weeks ago to find that everything I had posted here was gone, back to June of 2012. I've tried to get help with no response, so I guess I'll just have to ignore it and go on. I don't remember any of what I've written since then, so I guess I'll just post some news and updates. My partner expanded on our Virginia Beach Attractions website. We added a bunch of pages for homes in Surfside Beach and Pawleys Island on the C21 Harrelson Group site. 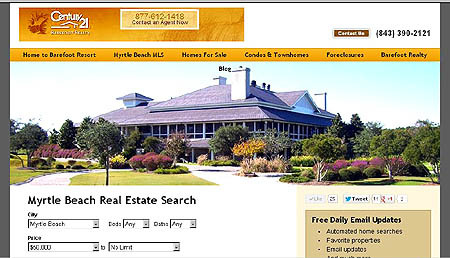 I also created a new Google Plus business page for their Myrtle Beach C21 website. We also have a new Google Plus Myrtle Beach Community page! Greg purchased the Century 21 agency in Barefoot Resort, and we completely overhauled their website for Barefoot Resort Homes. Real estate has really picked up just about everywhere and is going full tilt in Myrtle Beach, by the way. Home prices are rising, sales are rising, more people are getting sales licenses. More customers are coming to me. I've just begun to do two new California agency sites...more on that when they're done. Things are definitely looking up for the whole industry, and it's about time!